Fractures, or breaks, can potentially occur in any bone in a horse’s body. Some types of fractures, however, are more common, especially among very athletic horses, such as racehorses. An incomplete fracture (also known a “green stick,” stress or microfracture) occurs when cracks form in the bone, without the bone breaking completely. These can result from repeated wear and tear during exercise, especially when the horse isn’t given enough time to rest. A complete fracture involves a bone breaking into separate pieces. This is often the result of a traumatic accident or injury. If the bone breaks into more than two pieces, it is called a comminuted fracture. A compound fracture is a type of complete fracture in which the bone penetrates the skin. A chip fracture occurs when a small piece of bone breaks off. These often involve the fetlock, knee or hock joint. They can result from cysts in the bone caused by a disease that affects the bone development. Complete fractures are often easy to identify. The breaking of the bone may be accompanied by a loud cracking or popping noise. After that, the horse will develop severe pain and swelling at the site of the fracture and will be unable to put weight on the affected limb. Incomplete fractures are more difficult to identify. In the beginning, a horse may only show signs of lameness. It is important, however, that these be diagnosed early, because they can eventually lead to a complete fracture. X-rays (radiographs). A type of imaging test that uses radiation to produce an image of broken bone. This works well for complete fractures, but may not detect stress fractures. Nuclear scintigraphy. 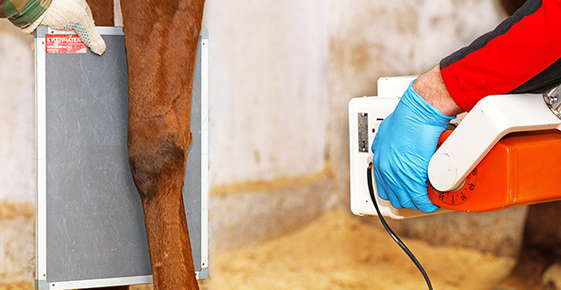 Also known as a bone scan, this imaging test involves the use of a radioactive compound that is injected into the horse. This allows the equine veterinarian to see areas in the body that have greater metabolic activity, such as the site of an injury. Over the past few decades, treatment for fractures in horses has improved greatly, including new methods of stabilizing broken bones and better anesthetics for use during surgery. That means that some fractures that were once life threatening can now be treated; although the horse may need to be transported to a major equine surgical center. The first step in treating complete fractures is to move the bones back into the correct position. This usually requires anesthesia. For larger bones, special equipment may be needed to pull the bones into proper alignment. After that, the pieces of the bone are fixed into place using casts, screws, pins or plates. These are left until the fracture has had time to heal. Screws or plates may be left in place after the bone has healed. Simple fractures can sometimes heal with the use of only a fiberglass cast, without the need for surgery. These casts, while cheaper, need to be changed frequently under anesthesia. If you believe your horse has suffered a bone fracture, call us today to schedule an appointment. We will assess your horse’s bone health and offer treatment suggestions.